Most students will use medical, counseling, or health education services during their time at HSU, and a healthier campus has a positive effect on the success of every student. With limited community resources, HSU’s on-campus Health and Wellbeing Services are the only resource for many students. You may wish to take a look at the relevant information on this site including the data on increasing student needs, cost factors unique to our region, answers to frequently ask questions, and any other information you would like, and then share your thoughts about your priorities. Based on the recommendation of the Student Fee Advisory Committee and the Alternative Consulation process, the Student Health & Wellbeing Services fee should be adjusted. Health Fee Adjustment Consultation Report and 5-year Strategic Plan: The full report, summarized in the Execuitve Summary above, provides information on the needs for health fee adjustment, the alternative consultation process, and the Student Health and Wellbeing Services 5-year Strategic Plan. Appendix A: Health Fee Adjustment Website Survey - A website was created specifically for the student health fee adjustment campaign to allow students to learn and share perspectives on prioritization via survey. Appendix E: Students received 2 emails from the Office of Institutional Effectiveness asking for participation in the National College Health Survey. 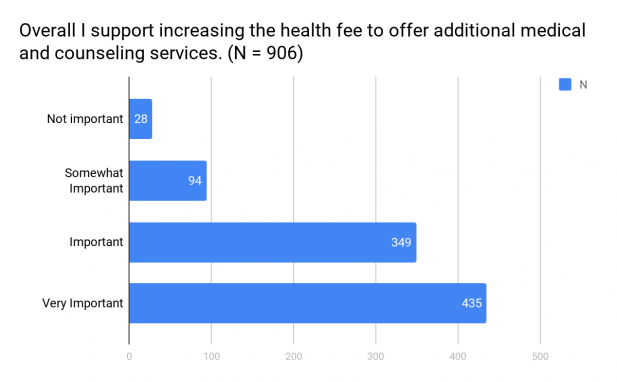 The survey included questions about the fee adjustment and prioritization. Appendix F: Email 1 from the Vice President of Student Affairs directing them to the HSU Healthier Together website, open forums, and to look for an email regarding the NCHA survey. Appendix G: Email 2 from the Vice President of Student Affairs directing them to the HSU Healthier Together website, open forums, and to look for an email regarding the NCHA survey. Appendix H: Email 3 from the Vice President of Student Affairs directing them to the HSU Healthier Together website, open forums, and to look for an email regarding the NCHA survey.